My role in Jamaica as a Health Promotions Manager Intern has been highly involved in promoting the Jamaica Family Planning Association on social media. Our newest and best avenue has been our Twitter account @FamplanJA (Feel free to give us a follow so I can reach my targets!!). For those who know me well, they know how much I love to keep on social media and celebrity gossip, so this is right up my alley (my fellow interns in Jamaica can attest to this). A popular thing to do among the multitude of different advocacy organizations in Jamaica is to host Twitter chats. You may be wondering what a Twitter Chat is, like I also wondered my first time hearing that. A Twitter Chat is a conversation on Twitter that participants answer questions and engage in conversation using a common hashtag. The purpose of this is to raise awareness, educate participants and users, and to keep the conversation going on rather hot topics. Through our newly established Twitter account we are quickly growing in popularity through participation in Twitter chats. We have participated in chats surrounding hot topics that directly align with the work we are doing here: comprehensive sexuality education (CSE), world AIDS day chats for HIV prevention, ending violence against women, gender equality, just to name a few. The Twitter account is a new experience for me but I love every second of it. It is such a great way to network with other NGOs here in Jamaica, and develop relationships with colleagues that strengthen JFPA’s partnerships. For example, one of our favourite Twitter advocacy accounts is from an organization called WE Change that is committed to increasing the participation of women in social justice advocacy. We recently helped co host a Twitter chat with WE Change surrounding the topic of CSE using the hashtag #SexPlanning. Feel free to check out the thread. We shared facts about the need for CSE in Jamaica, and answered any questions for participants. Not only did we gain a lot of followers through this, we were able to gather information about the needs of Jamaican citizens, as well as educate participants about what CSE actually is. This Twitter Chat generated 704 tweets, with 690 000 impressions. This means that the tweets were delivered 690 000 times on twitter streams. With this many impressions, we have greater chance of educating the young people of Jamaica, and putting out quality information for participants and readers. Who knew Twitter could be such a powerful platform? This Friday, December 9th, @FamplanJA is hosting our first ever Twitter chat in honour of Human Rights Day on December 10th. 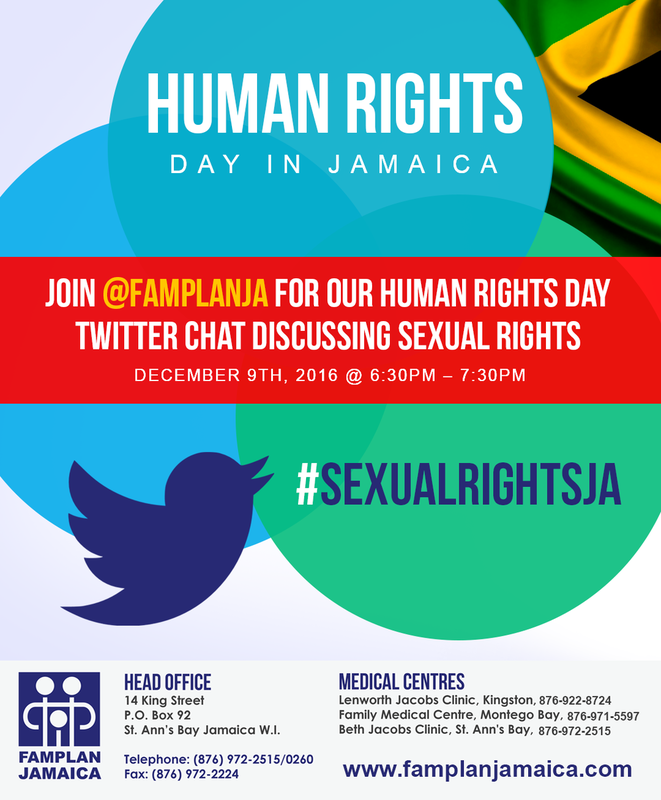 We will be using the hashtag #SexualRightsJA to discuss the fact that sexual rights are human rights. We have targets we hope to reach, and from this we hope to learn more about the challenges Jamaican’s face when exercising their sexual rights. I am nervous for the Twitter chat, but with support from many fellow NGOs, I think it will be a success. We have even partnered up with an organization called Caribbean Vulnerable Communities Coalition to have tweets from the Twitter Chat live streamed at their Human Rights Day cocktail party event, which will hopefully increase participation! Here is an ad that I worked with the graphic designer to design to promote the upcoming Twitter Chat. So far we are starting out small. A month in and we have just over 100 followers, and 500 tweets. Over the next couple of months we hope to gain more so that we can widen our impact on improving access and education about sexual and reproductive health in Jamaica, as well as promoting JFPA. Additionally, we are strengthening our participation with LGBTI organizations, feminist organizations, youth organizations, and more. This makes for better collaboration between everyone, and a great avenue for sharing different advocacy events going on around the island. We are even nominated for a social media award for best new Twitter account which I am hoping we will win! Let me just finish up and say, I have a new respect for the social media gurus out there! This twitter account is a 24/7 job!